Well planned, and maintained 4 bedroom, 3.5 bath two level home on Alpine Drive across the road from the advanced slope at Appalachian Ski Mtn. 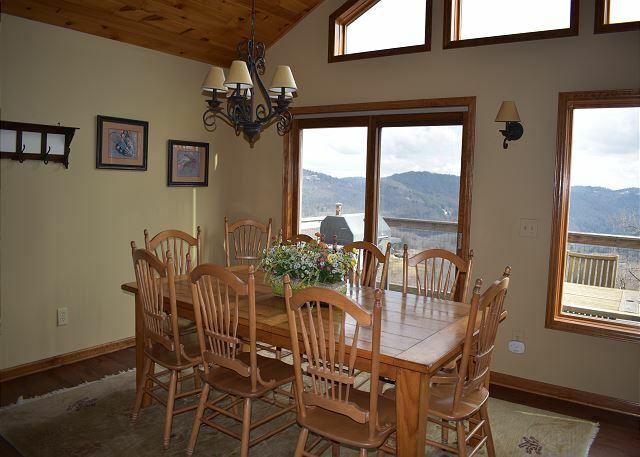 Fantastic mountain range view from all rooms, cathedral tongue & groove ceiling in the great room, stone fireplace with gas logs, comfortable furnishings, TV VCR/DVD, internet, AC. Large kitchen with plenty of space for all the cooks in your party. 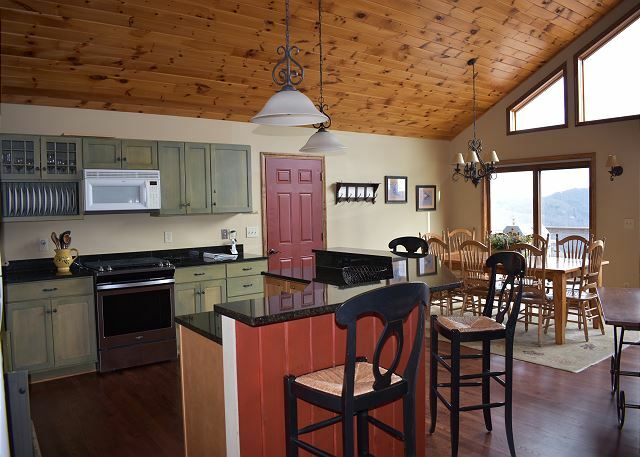 Granite counter tops and stainless steel appliances, breakfast bar for 3, dining area seats 8. Warm colors through out, lots of decorating extras. Master bedroom on the main level with a King size bed, TV, private bath with whirlpool tub. Master bedroom and living room have access to open deck the full length of the house. One car garage with two steps into main level. 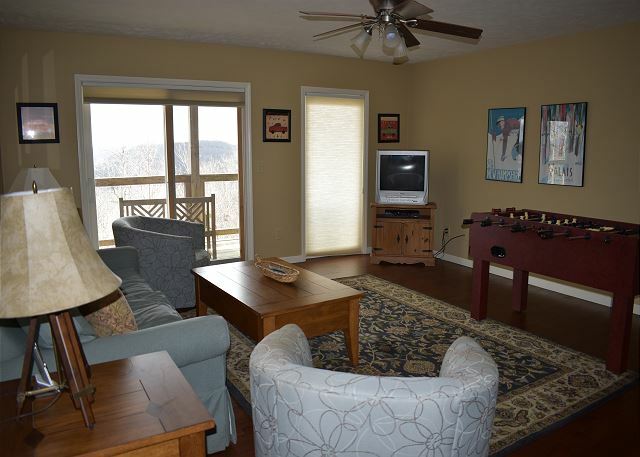 Downstairs family room with Foosball, TV, queen size sleep sofa and access to lower deck. 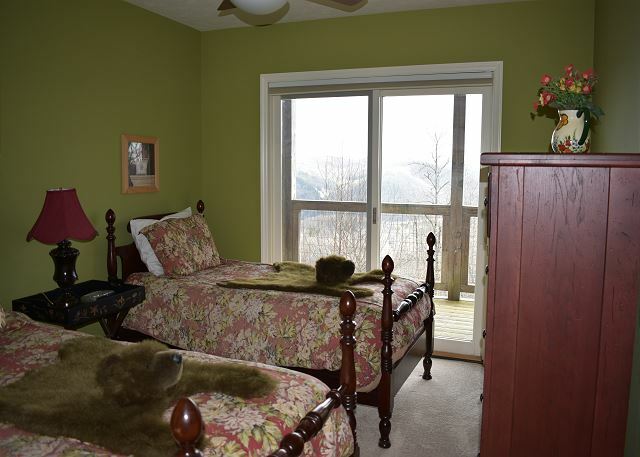 Guest bedroom with a beautiful queen size sled bed, access to lower deck, adjoining bath. Guest bedroom with a queen bed, access to lower deck, additional guest bedroom with two twins, access to lower deck, hall bath. Paved driveway with parking for 2-3 cars. Four wheel drive required in winter weather. Property maps may not be accurate on 3rd party web sites. Please contact the office directly for exact property locations. We rented Rudy’s Roost for a family Thanksgiving getaway. The house was perfect for our group — 7 adults, 2 toddlers and an infant. It was clean, well equipped, and had comfy beds. The kids loved hearing the train from Tweetsie! Wonderful mountain cabin with amazing views! 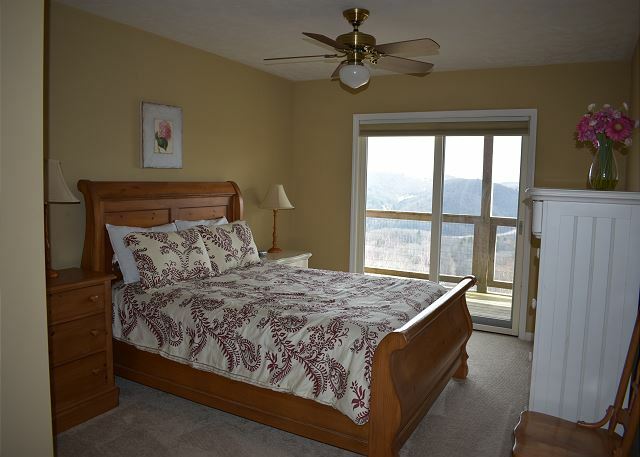 Great floorplan for families with tons to do in the Blowing Rock/Boone area. Equipped with all your needs. We stayed at Rudy's Roost for Appalachian State's homecoming weekend. We were a group of (6) college sorority sisters! The house was perfect and the pictures online do not do it justice. The upper and lower decks overlook the Blue Ridge mountains. The house is spacious, clean and tastefully decorated. Jenkins Realty was helpful in choosing the right rental for our group. The staff was friendly and responsive. You will not be disappointed in this rental! Nine members of our family decided to get away for a weekend. We found Rudy's Roost an excellent choice! There were 8 adults and 1 middle school child. This place was beautiful! Every well equipped and clean! One adult had the hideaway bed downstairs which would be our only complaint. The frame appeared to not very sturdy and possibly bent, so he took the mattress off and slept on the floor. We did not want to be very far back off the beaten path due to my father having cancer and needed to have quick access to main roads in case we needed to seek medical attention for him. Thankfully we didn't have too, but was glad for the location. This was a wonderful weekend! 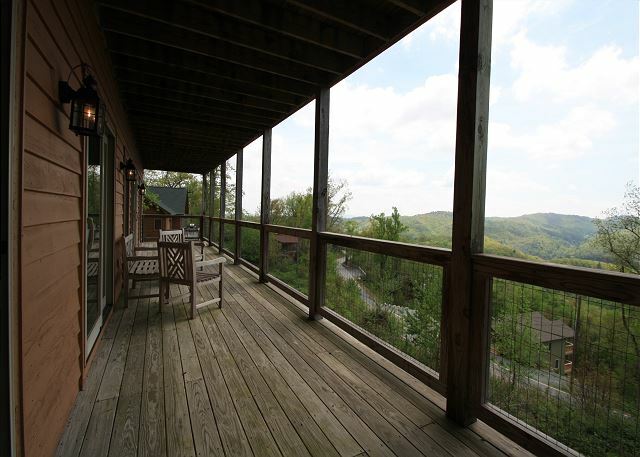 Great location in Blowing rock, close to everything. Great views, and close to skiing on mountain. Home was clean & cozy with an amazing view. Easy access on and off the mountain. Great open traffic pattern within the house. Beds were super comfy. Kitchen was well appointed. Would definitely rent the house again! Had a great time with family. Great views from every window in the house. We had a wonderful 4 day stay in Blowing Rock, NC.There were 5 people sharing a lovely house with a fantastic view. However, houses were very difficult to find and could definitely use some better signage. There were 5 houses in our reunion group and it was very difficult to locate each and physically difficult to visit each other. More signs and/or a more detailed map would have helped. Very nice home. Nice floor plan for a large family.However we had to drop all the garbage off at the local dump. However the dump was closed on sunday. We had many bags of trash that we had to take with us. Was not impressed! Thank you for taking the time to leave your comments. We do have a dumpster behind our office that you are welcome to use when the county dump sites are closed. Sorry for your inconvenience. Had a great time, however, one of our ladies took a pretty rough tumble down the stairs that are mighty close to the front door. Broken bone in her ankle and two black eyes. Oh Pat, I'm so sorry to hear one of your guests fell. I hope she's all right. If you are looking for a great spot to enjoy the view while cooking, singing , dancing and staying warm by the fireplace Rudy's Roost is the spot. My family spent Christmas there and had a wonderful time. The house was decorated for the holidays and perfectly clean and well equipped. We would definitly go back again . were comfortable. Loved the enclosed 2 car garage!! This was the fourth or fifth time we have stayed at Rudy's Roost and we have loved it. We have stayed during the summer, fall and winter. All seasons were great. It is such a lovely and comfortable house.